The caption reads that the executions are a revenge for the killing of a leader of the Isis, Abdul-Rahman al-Beilawy, whose death has been confirmed by both the government and Islamic State of Iraq and the Levant shortly before the group took control of Mosul and Tikrit, Tuesday and Wednesday. Most of the soldiers who appear in the images are wearing civilian clothes and some in military uniforms are seen to appear from below, which may indicate that they tried to disguise themselves as civilians in a hurry to try to escape. Many soldiers and policemen have left their military uniforms and their equipment while the militants entered in Mosul, Tikrit and nearby areas taking control. On Friday, the High Commissioner for Human Rights of the UN, Navi Pillay, had expressed “extreme alarm” at reports of war crimes from Iraq, talking about “murder of all kinds” and reporting that the death toll the last days of violence could reach hundreds of people killed and a thousand injured. 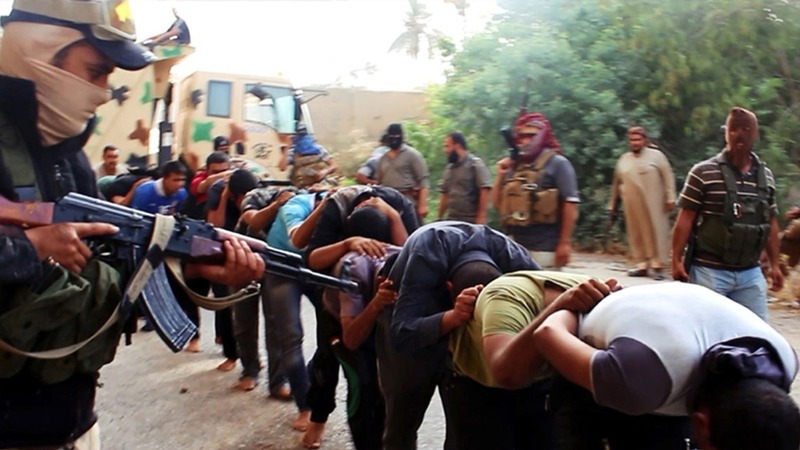 Pillay said that his office had heard of “summary executions” Isis after militants had taken control of several cities in Iraq.